Nutty and moist, this almond bread is both delicious and filling. I serve it like cornbread on the side of a meal. The kids and I need only the bottom half of a square spread with butter, while my husband takes 2. So I played around with the ratios of ingredients and of course I added fat — and here is the final recipe. 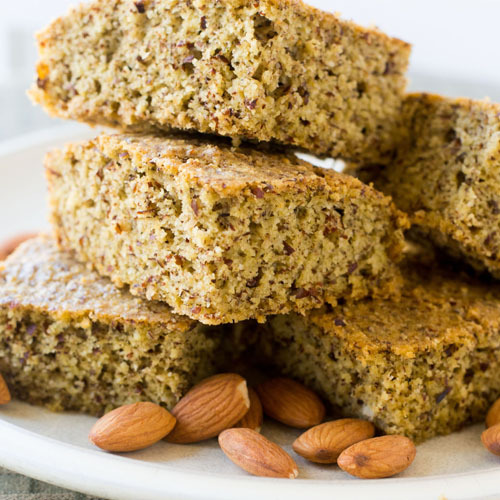 We really love THIS grain-free almond bread! Nutty and moist, this almond bread is both delicious and filling. I serve it like cornbread on the side of a meal. For a sweet bread, simply add sweetener and dried fruits. In a mixing bowl, beat eggs well with vinegar. I've used as little as 2 eggs, and the bread is fine, but a bit more flat. Add butter or coconut oil and whisk together until well combined. In a separate bowl, combine almond flour, flax seed meal, salt and baking soda. Mix with fork until well distributed. Add flour mixture to egg mixture and mix until smooth. Press into a greased 8-inch or 9-inch square baking pan. Bake for 30 to 35 minutes until golden brown or toothpick inserted comes out clean. Then, we cut each square in half horizontally and spread with butter. 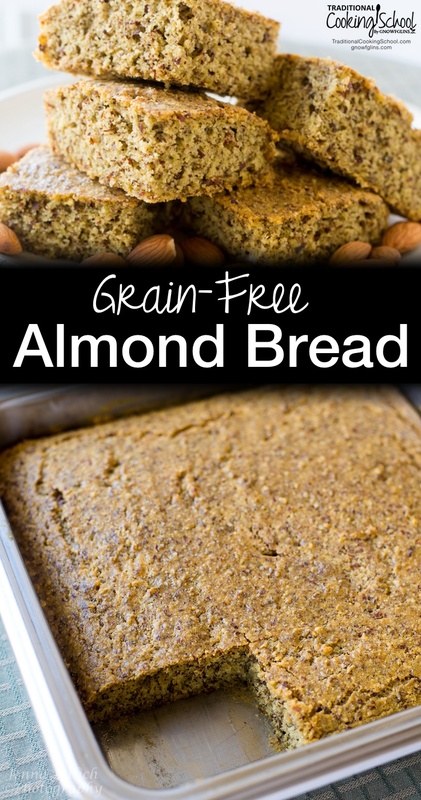 Have you tried grain-free almond bread? YUM! This looks similar to the GF bread recipe on Elena’s Pantry, which I’ve made and love. I can’t wait to try your recipe! I think I’ll make some this weekend! This sounda delicious! I now only do almond and coconut flour, so a bread recipe is always welcome. Is this recipe printable from your page? Rose – Yes click over and print. I just redid the blog and it doesn’t print as nicely… yet. I’m working on that! I’m planning on starting GAPS soon too and your messge made me laugh. I feel the exact same way. I’m praying for the strength I need to do this as I’m not even on a traditional foods diet and don’t usually cook every meal. Yes, very very scared. Wardee, have you posted on how you modified? If so I’d be extremely interested in reading more! Katy – no I haven’t, not yet. Great Wardee. I am going to try this. Thanks! I have a noob question: What does the flax meal do? We love sweet bread, so I will try this with fruits and nuts. I still have pumpkin in my freezer from last winter I need to use. Do you think it would be good with this recipe? Thanks. Gina — Yes, I think it would be wonderful! Are you thinking of using the pumpkin puree? You might need more almond flour to account for the extra liquid. I’ve tried this recipe for Pumpkin pound cake made with almond flour. It was really good and moist. I know you would have to tweak it a bit due to the sweetener. I love when my hubby likes my new food. Have you tried making this w/o the flax meal? a — No, I haven’t. But I’ll do so this evening and let you know. Anyway — it works, so give it a try. 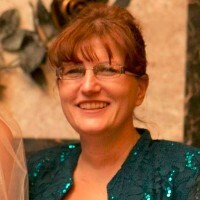 I am experimenting with a modest change. I am soaking the flour mix overnight in live buttermilk. This should replace the vinegar. I am not much of a butter guy unless the bread is fresh out of the oven. My favorite way is to soak the slice of bread in a chutney. I am pretty happy with how this turned out. This is a good basic bread. A thinner version with Italian herbs could make a reasonably savory focaccia bread. Can’t wait to try this Almond Bread recipe, Wardee. Looks terrific. What is blanched almond flour/meal? Just ground up almonds? And how do I blanch my almonds? Can I just soak them? Ashley — Blanched almond flour is ground-up almonds that were first blanched to remove their skin. I have made it myself and it is time-consuming. However, I’d still be willing to do it myself if buying the almond flour/meal wasn’t half the price of making it myself from almonds. Granted, the almonds I buy are organic and the blanched almond flour is not. So there is that. I just made this and it tastes great!!! Thank you for sharing! Thank you Wardee! I am looking forward to making this! I just want to say thank you for sharing this kind of stuff and I am very interesting to it. Hope I could do like this one of this days and I’m sure it would taste good so that my husband would like this. I can’t wait to try this Almond Bread recipe. They really look very mouth watery. I just wished there’s a video version of this one. And I also look at your site they really look amazing,. Wardee, I am so thankful to you right now. I cut grains out of my diet about 5 weeks ago, when I was 29 weeks pregnant. It came surprisingly easy to me, and seemed to help symptoms of nausea, lightheaded-ness, and fatigue. I have been enjoying legumes, squash, and potatoes, but sometimes miss the textures of a bread-y treat. I discovered pancakes made with almond meal, so I had some on hand when I saw your recipe. I did not use flax, so I got the corn bread look. I ate two pieces with butter and honey for breakfast when it came out of the oven yesterday – such a treat! I would be proud to bring this bread to a pot luck, too. The woman who recommended I cut grains out of my diet mentioned GAPS, so I would enjoy hearing your modified version and thoughts on this topic as well. Thank you, thank you, thank you! I am doing a special diet for my husband to help him overcome Crohn’s and almond flour is one of the only kinds of flour on the “okay” list. He has been missing bread. I just happened on this today and it is the oven baking as I type this. I’m making it with a lentil soup (Greek Fakes) that I make with home made chicken stock. I am also working on some homemade saurkraut and homemade raw milk yoghurt. Your website has been such a blessing an and inspiration. Bless you for all you are doing! Wardee, this sounds so intriguing – and flexible. I bet you could use it as a base for something like fruit butters (naturally sweetened), making it into something like a cookie or make it savory. You probably could even crumble it up and turn it into a bread pudding (sweet or savory) type of thing with extra eggs and dairy. It’s quite brilliant! This sounds delicious! I am happy that the flax is not necessary. Flax can be a phytoestrogen for some people – I happen to be one. So I avoid it and soy. But I love almonds and following GAPS/anti candida diet it is always such a treat to find a bread that I can eat AND that actually taste good!!!! Great recipe! I made it without the flax seed (not SCD-allowed). I buttered a piece of parchment paper the size of my 12×14 baking pan, put the dough on one end, spread it out a little, folded over the paper, evened out the dough with a rolling pin, slid the whole thing onto the baking sheet, peeled of the top paper – great result! This is the first SCD-ok bread that doesn’t taste mostly like egg. THANK YOU! Can’t wait to try this Almond Bread recipe, Wardee. Yes, very very scared. The woman who recommended I cut grains out of my diet mentioned GAPS, so I would enjoy hearing your modified version and thoughts on this topic as well. I just made this tonight – OH YUM! It is delicious! Thank you so much Wardeh, I have been cheating with bread and I think this will stop that naughty habit! I put garlic and onion powder plus oregano in it – my kids raved about it. It would make a good pan of dressing! This will be our regular bread for now. I used your recipe as written, except used only 2 eggs, increased the flax meal to 1/3 cup, and heaped the cups of almond flour just a bit, added 1/3 cup of honey, and about 1 1/2 cups of cooked pumpkin. I added about a teaspoon of cinnamon, 1/2 teaspoon of ginger, 1/4 tsp clove, and a dash of allspice. Thanks for this. Its getting me through my first couple weeks of going grain-free (mostly). Sure, no problem at all. Enjoy. I’ll look forward to the meal plans. Have you ever tried sprouted almonds if so how long can the almonds be sprouted for to make almond flour? Janet — No, I haven’t. But as a general rule with other sprouted flours, the shorter the spout the better the flour turns out. I just made this recipe last night and can’t believe how good it was, thank you for the wonderful recipe. Does nobody care that this makes for a very salty bread, or is that the preference? Not having a go, just curious, as I am Australian and our breads and scones (you call them biscuits?) are generally far less salty. A pince of salt is all! Rebecca — It must be a preference thing. I admit that I like salty. However, I don’t often hear that my recipes are too salty. Unless most people are just not mentioning it. 😉 Go ahead and reduce! How much flax seed do you need to make 1/4 cup meal? I think instead of flax meal, I’m going to add chia seeds. I have tons of almond flour since I dehydrated and ground the spent pulp left over from my home made almond milk. I have so much of it, I put it up in 8cup packages in mylar bags (complete with desiccant pouch and oxygen absorbers). I’ll definitely try this (and the on elanaspantry.com) and experiment a little…. FYI on sprouting almonds… only genuine raw almonds can be sprouted. You can only get those privately through a farmer. All almonds available through stores are pasteurized and will not sprout. I just soak mine overnight before making my almond milk…. makes for easier digestibility. I made this and it was delicious! I added some raw chopped almonds and some chopped dates and my husband loved it! Thanks! Thank you for this recipe. I’ve been on a low carb diet for a while and have tried many bread recipes before. I must say this is the best of them all. It’s a lovely bread, full of flavour and it goes well with butter or any other dip. What I like the most is that this bread doesn’t taste of bread soda. The reason why other recipes fail is because they use way too much bread soda. I always omit sugary ingredients –which in my opinion are used to mask the strong, salty bread soda flavour– such as agave nectar, honey, etc. The flavour of this bread is excellent. Thanks so much again. Hi Rebecca, when you first go low – carb, everything tastes ridiculously salty until your body adjusts fluids and electrolytes. Leg cramps are common in the first few days too. Idk if that may be a reason this tastes salty to you? Replacing salt with low-salt (more potassium, less sodium) can help. Also, replacing baking soda with baking powder can reduce the saltiness. Giving up wheat and other grains and needed something to replace the sandwich bread I knew I would be missing..I’m one of those girls who never met a bread she didn’t like…so thank you for posting this recipe..
Can you share any experiences you have with this or coconut flour based baking withOUT eggs? How does Ener-G’s egg replacement work, for example? Can’t do eggs or dairy… Have just discovered almond and coconut flour and am very excited but not finding much to address the egg issue? Thanks! Could I add a sweetnter.. like honey or agave to this recipe? i was very excited to make this bread and didn’t have flax, so after reading comments i went ahead and made the bread without flax and added more coconut oil. however this bread came out totally dry. i mean i could not swallow it. i was so disappointed! did i miss something? any suggestions? I made this recipe today and I’m very happy with how it turned out. I dialled down the amount of salt by half because I like a less salty bread (personal preference). I added chopped herbs (sage and parsley) and about 1/2 cup of grated pecorino cheese (parmesan would have a similar taste) then sprinkled more pecorino over the top. Beautiful flavour, and the cheese on top gave it a nice extra crunch. I will make this again and try a sweet version with dried fruit and some spices. Thanks for a lovely recipe. I just made this. It was amazing! I added one tablespoon of maple syrup and used 3 eggs. I baked it in a 7.5 x 3.5″ load pan for 40 minutes. Thanks so much for posting!! My husband and I love this bread. :)- We like to spread ghee on top and drizzle with a bit of honey. Thanks for posting this delicious recipe. Are there nutritional facts available? Just curious. This bread looks great. I was wondering if the flax seed is necessary though. I would like to make it without it if its possible. How would that affect the final product? Do you suggest replacing it with something else? I make it without the flax seed and it turns out great. I add extra almond flour (the amount of flax seed called for) to accommodate. The texture is great and the flavor is wonderful. I can’t compare it to the final product with the flax seed since I’ve never tried the original version. Hope that helps. If I was going to double this and make it in a loaf pan as you mentioned as an option–how long should I cook it and at what temperature? Wow! I just started a wheat free diet and looked up your recipe as a way to use almond flour and what a treat! I added 2 teaspoons sugar and 1 tablespoon honey and some dried blueberries, used 4 eggs and no flax. The result is something I am thinking my twelve year old is going to love in his ouch tomorrow! Thanks for posting.. I will be trying it again with all the variations. Yummy! No back to eating this delicious square. I’ve freshly pulled this from the oven and waited (no time at all) to cut a slice, smear with homemade butter, and mindfully devour. Thank you for this beautiful alternative to cornbread, Wardeh! I believe I’ll be making another batch tomorrow with roasted hatch chiles and cheddar. Any advice? I’m curious… if anyone has made this recipe without the eggs (I cant tolerate them) + what result or changes you got? Thanks in advance! This sounds WONDERFUL! Thank you thank you for this simple and delicious recipe…. I have made it for 3 weeks straight and eat it every morning toasted with my eggs and it is saving my grain free life right now !! So nutty, so good, so EASY. I omit the flax seed and like it better, I use 4 eggs and add a lot of Italian herbs then slather with coconut oil when hot. YYUUMM … Thanks again ???? I am wondering can this be frozen and thawed as needed?? I am the only gluten/ and now grain free one in the house, and doubt I would eat a whole loaf by myself before it going bad..
I’ve made this bread, the bread ended up very flat. I wonder how long did you beat the eggs? Wardee has not has this turn out flat. She doesn’t beat too much, just whisk until well mixed. Perhaps maybe use another egg and beat well.